Well, we’re seeing this early this week thanks to the Thanksgiving holiday — no pun intended — but the good news is that we’ve got LOADS TO COVER. BOTH Meghan and Kate came out today — ladies, I love you, but I’ve got a LOT to do right now and I need you to stay home until Friday. Thanks very much. 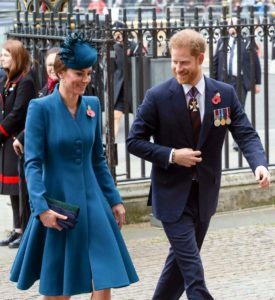 In case you missed it here earlier this week, Harry and Meghan went to the Royal Variety performance and I liked Meghan’s outfit but I was alone on that island! Also! We looked at some of the shots from the set of season three of The Crown and their Prince Charles looks good, AND Olivia Colman is a treasure. Omid Scobie had excellent coverage of Meghan’s outing today, at Harper’s Bazaar. This story, at VF, just makes me chuckle: New Report: Meghan Markle’s “Up and at ‘Em West Coast Energy” Has Palace Staff Baffled. You guys, she TEXTS IDEAS TO PEOPLE!!! Scandale! Oooh, at the Court Jeweller, it’s the Most Expensive Jewels from the big Bourbon-Parma Auction at Sotheby’s this week. I laughed at this headline at Celebitchy: Duchess Meghan’s 2018 American tax filing is going to be a gigantic mess. Join the club, Meghan! Harry is promoting getting HIV tests again, which is great! The Duke of York is currently on tour in Australia with Pitch@Palace – his events which allow entrepreneurs to promote their ideas to an audience of people who can help make their business dreams a reality. ‘Boot camps’ have already been held at the Sydney Opera House and Government House in Melbourne. Next stop Perth! The final will take place in Queensland later in the month. Fugs and Pieces, November 21st, 2018: Happy Thanksgiving!